Concerned your Toyota floor mat may kill you? Us too. 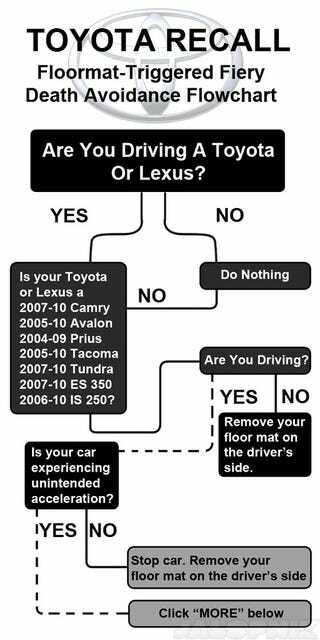 Luckily, Toyota's provided this handy guide for what to do if you think your Toyota/Lexus is part of the recall. Click "more" to avoid a fiery death. As you can see from the handy flow chart above, we're now at what you should do if your vehicle continues to accelerate rapidly after release of the accelerator pedal. Toyota tell us "this could be an indication of floor mat interference.," which is somewhat of an understatement. If this occurs, in addition to praying to your preferred deity, click "next" to see what Toyota recommends the driver do (The rest of the information below is is straight from Toyota — no added snark. Well, maybe just a little.). Step One: If it is possible and safe to do so, pull back the floor mat and dislodge it from the accelerator pedal; then pull over and stop the vehicle. Step Two: If the floor mat cannot be dislodged, then firmly and steadily step on the brake pedal with both feet. Do NOT pump the brake pedal repeatedly as this will increase the effort required to slow the vehicle. Step Three:Shift the transmission gear selector to the Neutral (N) position and use the brakes to make a controlled stop at the side of the road and turn off the engine. If unable to put the vehicle in Neutral, turn the engine OFF, or to ACC. This will not cause loss of steering or braking control, but the power assist to these systems will be lost. Step Three-Point-One:If the vehicle is equipped with an Engine Start/Stop button, firmly and steadily push the button for at least three seconds to turn off the engine. Do NOT tap the Engine Start/Stop button. Step Three-Point-Two:If the vehicle is equipped with a conventional key-ignition, turn the ignition key to the ACC position to turn off the engine. Do NOT remove the key from the ignition as this will lock the steering wheel. Your Toyota or Lexus should now be stopped and fiery death avoided. Hooray!